A lateral mark in France, marking the port side of a channel. In America the color would be green. The bigger the boat, the more seaworthy it is. The natural home of most very small boats is the lake, harbor or sheltered estuary. Sea kayaks can cope with open sea and exposed coastlines. What other small boats are safe at sea? Most small boats being made today are designed for a gas or diesel motor and are pretty hard to move with oars, to the extent of being helpless if the propellor stops turning. They have given a generation of boaters the impression that rowing, paddling and sailing are difficult and possibly dangerous when in fact they're good exercise and a real pleasure. Of course Kayarchy prefers boats which slip through the water so easily that a motor would be a burden. It's hard to beat a sea kayak because you can put it on the roof-rack, drive to someplace nice, go afloat for a few hours without pollution or scaring off the wildlife, and go back home. So a sea kayak gets used when anything else would be "too much trouble, I'll go for a walk". But there are other seaworthy small boats powered by sail and oar. If a sea kayak capsizes you can roll it back up in a couple of seconds without getting much more than your head wet. Other boats usually require a soaking-wet crew to get into a position where, by hauling on a rope, they can roll the boat back upright and scramble in. 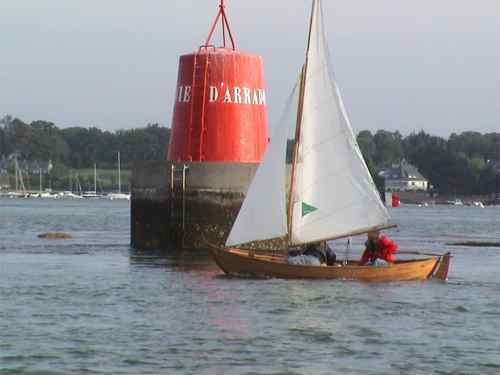 A sailing yacht will (God willing) roll itself back up thanks to a large lump of lead bolted to the bottom but a yacht falls outside our definition of small boat because the owner of even the smallest needs a road trailer, a slipway and probably a helping hand to launch and recover it. There are some micro-yachts for which plans are available. The catch is that to be really seaworthy they still have to be quite heavy, but we mention the Roamer sailing dinghy and Scandinavian-style sailing canoes. • My own 30 foot gig. She's really much too heavy to be on this website, but she has her own page because she's beautiful! • Manual of Yacht & Boat Sailing, Dixon Kemp. Written in 1878 but still the reference work on classic yachts and sailing canoes. Often re-printed by independent publishers. The chapter on sailing canoes has been reprinted as a separate book by publishers DN Goodchild but we recommend the complete modern edition revised by John Leather (Ashford Press, 1988), currently out of print but available secondhand. Alan Byde, who wrote many good canoeing / kayaking books in the 60s and 70s, once spent a few weeks on the west coast of Ireland, working with a traditional boat-builder to make a 19 foot Aran curragh which he named the St Caoman. See below. 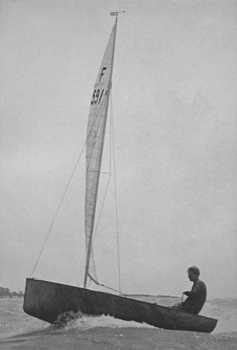 Christopher Cunningham, editor of Sea Kayaker magazine, built himself an 18 foot William Chamberlain / John Gardner-type gunning dory. This is a beautiful, slim but fairly heavy rowing-sailing boat. It can be rowed by one or two, has excellent rough water performance under oars, and sails well in moderate winds. The design closely resembles François Vivier's Youkou-Lili. Full details are in John Gardner's book. And he also built himself a version of the Gokstad faering, for a 1100 mile rowing trip along the Inside Passage to Juneau, Alaska. See below. Brian Schulz of www.capefalconkayak.com built himself two ravishing ultra-light Adirondack Guideboats, 13 feet and 15 feet long. Again, see below. Uffa Fox, perhaps Britain's best-known designer of small boats, loved to fill a 12 foot Firefly with inflated air bags, find an equally reckless crewman and sail home through the worst sea and wind conditions the Isle of Wight had to offer. The Firefly is made of hot-molded wood veneer. It can be sailed by one or two people and has quite a powerful rig for a small dinghy. It's a nice boat and was very popular for many years until it was replaced by the 13 ft 10 in fiberglass International Laser shown below. The Laser is a very nice one-person boat, although to Uffa Fox it would have looked more like a sailing surfboard than a dinghy. The hull is only about 14 inches deep and completely covered with a molded deck in which there is a small depression, like a shower tray, for the sailor's feet. When sailing, the sailor spends 95% of the time sitting on the outer edge of the deck, leaning backwards as a counterbalance to the wind in the sail, and often with his or her backside dragging in the water. A Laser's tall, powerful rig and unsinkable hull make it wild fun at sea in a Force 4 wind. One has been sailed around Britain but that must have been a very wet ride for a sailor with stomach muscles of iron. As with most modern racing dinghies, the entire hull is a sealed buoyancy chamber. This is great except in designs which have too much flotation so they float very high, making it difficult for a crewman in the water to reach the centerboard and urging the mast underwater into a full capsize (1). 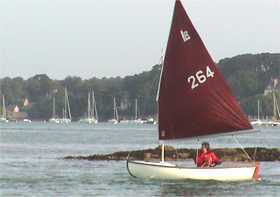 A sailing dinghy for use on open water, other than very near a safe harbor or beach, must have a way to reduce its sail area at sea if the wind gets strong. That's not possible with many popular classes of dinghy. If you want to explore exposed coastlines in a small sailing boat, there's a lot to be said for a stable, low-performance, short-masted 11 or 12-foot dinghy. They are available new or second hand, or you can join the traditional sail revival and build your own like the Laïta design shown here. The Mirror is a short, cute, lightweight boat. 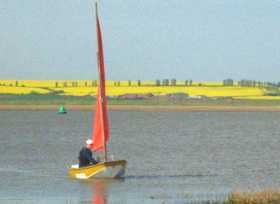 It rows surprisingly well for a short sailing dinghy and can be sailed by one or two adults. Tens of thousands have been sold worldwide and the class association says it's "the world's most popular double handed sailing dinghy". 10 ft 10 in long, 4 ft 7 in wide, 135 lbs complete, mainsail 49 sq ft, jib 20 sq ft.
Or there's the Otter, 12 ft long, 4 ft 11 in wide, takes two, 56 square foot mainsail, 19 square foot jib. A nice boat, difficult to capsize even if you accidentally let go of both sheet and tiller during a strong gust (done that) but it's getting a bit big and heavy to haul up a strange beach in gathering darkness, and it has a tall one-piece mast so you can't take down the top half in windy conditions. A rowing boat is heavier and bulkier than a kayak and a good one is a lot more expensive. Most rowing boats require a dolly to get them in and out of the water, and either a trailer or two strong people to get them onto a roof rack. And of course when rowing a boat, you face the wrong way so you have to look over your shoulder a lot. 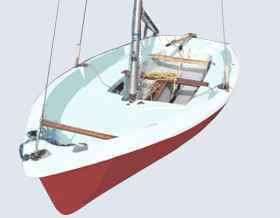 Unless you stand up to row like a Maine lobsterman in his peapod or you fit the ingenious Frontrower system designed by Ron Rantilla. www.frontrower.com. This highly efficient unit can be fitted to Canadian canoes and similar boats up to 36 inches wide. Remember the little swamp boat in the Tommy Lee Jones / Wesley Snipes movie US Marshals? Ireland's west coast is exposed to the full force of north Atlantic gales and their legacy of big waves. The local solution is the currach, curach or curragh. These canvas-covered rowing boats come in a range of shapes and sizes from a two-person "canoe" 16 ft 6 in long, up to a 27-foot naomhog which needs four crew, can carry a ton of livestock or building materials but may weigh as little as 200 pounds. When a small currach gets to the beach, the crew flip it upside down, put it over their heads and walk up the beach like a four-legged beetle. Most currachs have very high rocker to help them rise over steep waves, often to the extent of looking like a giant black banana. The hull cross-section is remarkably rounded, showing that it is intended for rowing, not sailing. On the rare occasions when they are sailed, steering is done with an oar over the stern. They have no centerboard or keel. This makes them maneuverable in rough water and means that if they get hit from the side by a breaking wave, they slide sideways rather than tripping up and capsizing. They are occasionally fitted with a leeboard but cannot really be sailed upwind. When sailing schooners fished for cod in the stormy waters of the Grand Banks in the north Atlantic, they carried many little dory boats. For cheap construction and efficient storage on the schooner's deck, the dories were built with a wide flat bottom, high flaring sides, and a tall thin transom which slopes sharply backwards. The design meant that one dory would nest in another and they could be stacked half a dozen high, like empty crates. They turned out to be surprisingly seaworthy. To see them in action, see the classic movie Captains Courageous (Freddie Bartholomew, Spencer Tracy, 1937). There are many stories of lost dories which survived a night in an Atlantic winter gale and were picked up by the schooner the next day with the one- or two-man crew nearly dead of cold. A dory usually has high sides which keep its crew dry and make it excellent in rough water, but mean that in strong winds it will blow around like a weathercock unless weighted down with two crew and two hundred pounds of cod. Even the senior editor of WoodenBoat magazine says"unballasted Banks dories are notorious for their vicious motion in steep seas... and for a generally cranky nature". Some, for example the Whitehall boat, closely resemble the smaller boats carried aboard 18th century sailing ships. Seen at a rally of traditional boats in the Golfe du Morbihan, France, the boat in the foreground is a fast, elegant rowing boat. It has a vertical stem with a very fine, knife-shaped entry, and a wineglass-shaped stern. 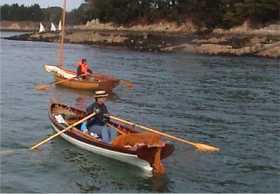 It is fast, particularly with two people rowing, but with its high sides and high rowing position and slim bow it is not suitable for really exposed waters. Typically about 16 feet long and 39 inches wide, they are just wide enough for a decent pair of oars without the need to put the rowlocks on outriggers, although you do have to cross your hands during the stroke. Guideboats are narrow at the waterline so they are easily driven but have low initial stability. In other words, they feel tender. Standing up in an unballasted Guideboat is a balancing act. However they have high secondary stability from the outward flare of the sides of the hull. Many daring coastal journeys have been made in the USA in similar boats rowed by one or two people. The St Lawrence River Skiff has almost the same cross-section as the Adirondack Guideboat and is often the same length but has also been made in longer versions, some as much as 23 feet long. Extra length rather than extra width gives them enough weight and stability to sail well on open water, if the sail is small and the crew are careful. And although it is beyond most people's resources, we have to mention one of the most beautiful, the slim 22 foot faering which was excavated from the Viking ship burial at Gokstad, Norway. Some fine replicas have been built, in particular one by Svein Erik Øya which is based at Sandefjord, home of the Gokstad kystlag or ship guild (http://home.online.no/~joeolavl/viking/gokstadfaering.htm). Touring shells, also called recreational shells, are about 18 feet long for a one-person boat. They look like the rowing skiffs used for flat water racing but are intended for use on open water so their hulls are a bit wider and more stable. However they are still less than 39 inches wide, which is about the minimum distance between rowlocks, so as with rowing skiffs the rowlocks have to be on the end of metal frames bolted to the sides of the hull (outriggers). 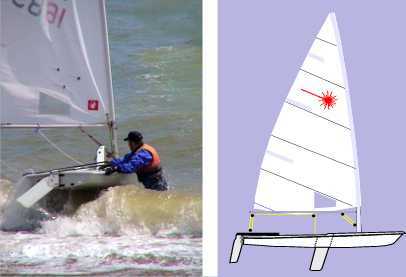 Touring shells usually have unsinkable hulls made of plastic composites, like a skinny version of the International Laser dinghy. Sometimes they have deck hatches to give dry stowage for camping equipment. The hulls of the Echo and Islander from Echo Rowing are as narrow as sea kayak hulls. At 52 and 63 lbs fully rigged, they can be lifted and carried by one strong person. www.echorowing.com. A touring shell's sliding seats and outrigged oars give it real speed but the outriggers make it hard to get in and out, except alongside a dock of exactly the right height. To help overcome this, Echo Rowing have a patented folding outrigger system. The rigger arms are designed to disintegrate progressively if excessive force is applied to them, for example if the shell is capsized by wave action. "First the E-clip will break if the force is upward, next the mounting bracket should tear, and finally the mounting bolts should pull out with repairable localized damage". The rowing position is great for estuaries, and for the coast in fine summer weather.